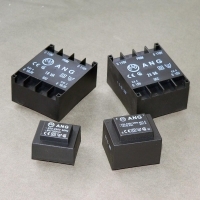 ANG company manufactures transformers for PCB mounting, with proven thru time and tested in the best quality Bulgarian laboratories. Transformers ANG are a symbol of the high quality and reliability offered by the company. Manufactured transformers are 1.3VA, 1.5VA, 2VA, 6VA, 18VA, and 24VA with a wide range of output voltages. Custom inputs and outputs are also available.